As Radovan Karadzic’s final verdict approaches, witnesses who testified against the former Bosnian Serb political leader recall how they felt when they spoke about his alleged crimes to his face in the courtroom. He greeted me by my name. He was very composed. Neither I nor he raised our voices,” says surgeon Youssef Hajir as he recalls testifying against Radovan Karadzic in court via a video link to The Hague. “I was really not nervous. From the beginning I made it my goal to tell the truth,” Hajir adds. This was not the first time that Hajir and Karadzic had spoken – the two men had known each other years earlier, in their university days. After arriving in Sarajevo from Syria to study, Hajir lived at the same student dormitory as Karadzic. “When I came [to Bosnia], I knew nothing. I did not even speak the language. He helped me. We hung out for a certain period of time,” Hajir recalls. “I never noticed any nationalist tendencies in him, at least while I was hanging out with him, I really did not notice… I was very surprised and disappointed when I saw that he was like a ringleader of all that,” he adds. While Karadzic went on to become the wartime political leader of the Bosnian Serbs, Hajir became the founder of a wartime hospital in Sarajevo’s Dobrinja neighbourhood, treating people who were injured by shelling and sniper attacks during the siege of the city – attacks which form part of the charges against his old friend Karadzic. “Seeing injured children was the thing that made the most impression on me. As I did not have general anaesthesia, the children were crying because they were in pain, but I just had to give them local anaesthesia, whatever we could find, but that was not enough,” Hajir says. Hajir was one of more than 500 witnesses who testified in Karadzic’s trial for genocide in Srebrenica in 1995 and seven other Bosnian municipalities in 1992, terrorising the civilian population of Sarajevo, persecution of Bosniaks and Croats in 20 municipalities across the country and taking UN peacekeepers hostage. In the first-instance verdict in March 2016, Karadzic was sentenced to 40 years in prison, but both the prosecution and defence appealed, and the final verdict will be handed down on Wednesday. Mirsada Malagic testified before the Hague Tribunal in four cases, but said her worst experience was at the Karadzic trial. After the fall of Srebrenica in 1995, Malagic’s husband, two sons, her father-in-law, two brothers-in-law and other family members were killed by Bosnian Serb forces. She says she knew Karadzic would cross-examine her “in a provocative manner” while she as testifying, but she was unnerved when he said he came from “a family of warriors” – hinting that her killed menfolk were combatants, not civilian victims. Malagic retorted sarcastically to Karadzic’s slight, saying that the Bosnian Serb political leader had “put all those ‘warriors’ like sardines in the Memorial Centre in Potocari [where Srebrenica victims are buried]”. 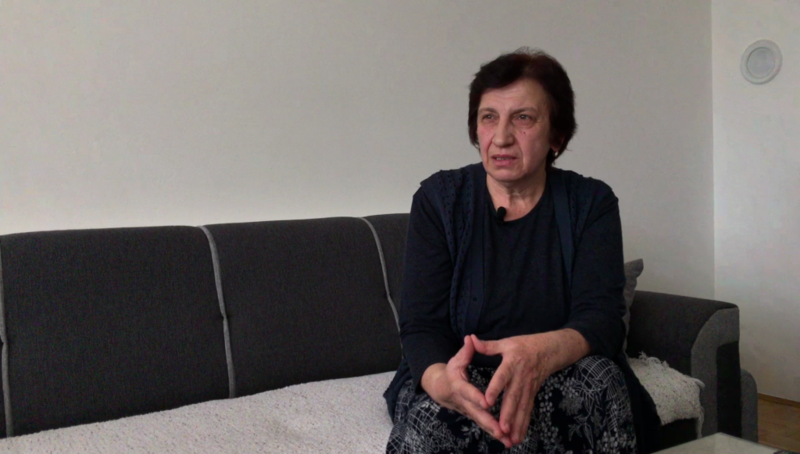 She explains how she last saw her husband and relatives just before Srebrenica fell to Bosnian Serb forces in July 1995, saying that she said her last goodbye as she was fleeing to what she hoped would be safety at the nearby UN peacekeepers’ base. “It happened at the petrol station near the hospital in Srebrenica. That is where we parted. While we were standing there, the shelling began. There was total chaos… Some were dead, wounded; we basically parted without saying goodbye,” she says. Malagic, who was pregnant, was injured in the shelling but eventually managed to escape to freedom with eight-year-old son. Tears passed and agony continued while she searched for her husband Salko and sons Elvir and Admir. “And then, just as I was giving up hope, on the 15th anniversary of the fall of Srebrenica, they found my husband and younger son,” she recalls. Their remains were found in graves in the village of Kamenica in Zvornik. “A funeral was organised; I buried them. Two years later, I buried my other son too,” she says. At Karadzic’s trial, she repeated what she had already said at a previous trial at the Hague Tribunal – that by seizing Srebrenica, the Bosnian Serb Army destroyed three generations of people. “My family is an example of that. My father-in-law Omer Malagic, his three sons, one of whom was my husband, his three grandsons, two of whom were my sons, not to mention his brothers, their sons – the entire Malagic family got killed in Srebrenica,” she explains. Witness Sanija Dzevlan also says she found Karadzic’s questions difficult and provocative. When she saw him in the courtroom, what passed through her mind was the killings of civilians – children, women and elderly men. “When he said to me: ‘Good morning, Mrs. Dzevlan’, I was really fearful and I simply did not know what to say in response. And of course, I did not answer his greeting,” she recalls. Dzevlan was injured in Sarajevo’s Dobrinja neighbourhood during the war while riding her bicycle to fetch medicines and water. “I was going across the bridge and I felt as if someone hit me in the back. At that moment, I thought somebody hit me with a stone, so I turned back and saw there was nobody around. But then I saw bullets on the street and I realised I was wounded and they were shooting at me,” she recalls. During her testimony at the Karadzic trial, she became very nervous because she found his questions unpleasant, and was even unable to hold a pen with which she was asked to point out the place where she was wounded. “After that, when it was finished, I felt horrible stress, so I cried a lot in the [court’s] preparation room,” she says. Dzevlan believes the court will uphold the first-instance verdict and convict Karadzic. “I expect them to sentence him. The mere fact that he will be sentenced as a war criminal means a lot,” she says. Hajir, Karadzic’s former friend in Sarajevo, argues that although the wartime Bosnian Serb president may not have directly participated in certain crimes, he should bear responsibility for them because of his leadership role. “After all, he stirred up the Serbs’ feelings and created a factory of lies against the other ethnic groups, and he should answer for that,” he says. Karadzic has insisted he is innocent of all charges and has asked the UN court to acquit him.